Even if you know the Apache web server inside and out, you still need an occasional on-the-job reminder -- especially if you're moving to the newer Apache 2.x. 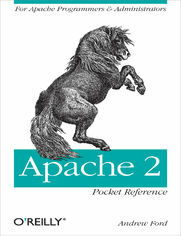 Apache 2 Pocket Reference gives you exactly what you need to get the job done without forcing you to plow through a cumbersome, doorstop-sized reference. This Book provides essential information to help you configure and maintain the server quickly, with brief explanations that get directly to the point. It covers Apache 2.x, giving web masters, web administrators, and programmers a quick and easy reference solution.